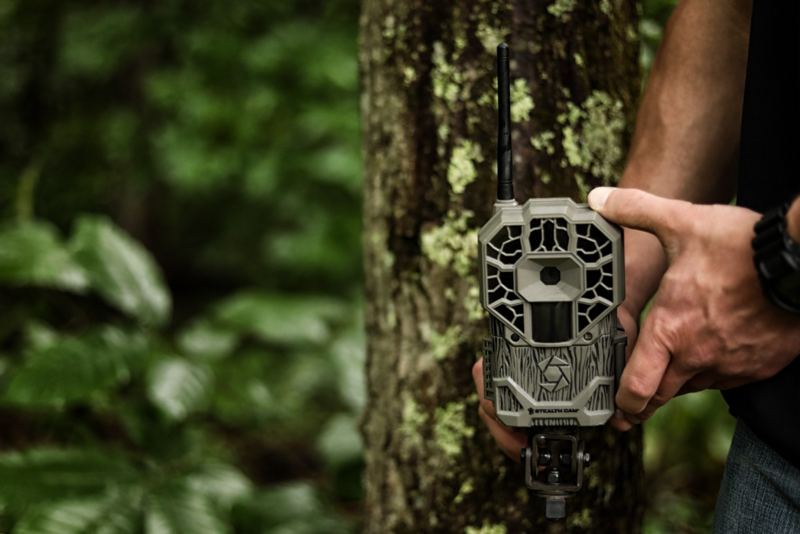 Wireless Technology: Is It the Missing Link in Your Whitetail Strategy? 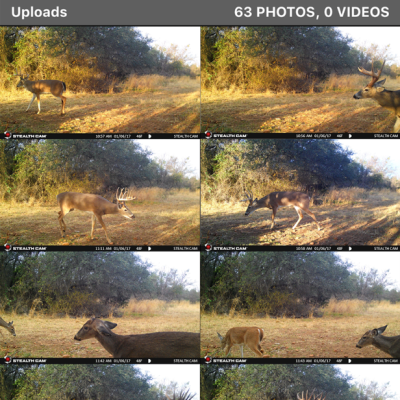 4 reasons why cell-equipped scouting cameras are the new deer-monitoring standard. Many moons ago just before my first hunting season, our mother bought my brother and me an early-model scouting camera — a 35mm dinosaur. Looking back, it was incredibly exciting to place the camera, wait several days and then check how many images it had captured. Even more exciting were the trips to get the films developed. Times and technologies have changed. Scouting cameras went digital many years ago, and just several years ago, some companies went cellular. Yes, cell-enabled scouting cameras require a greater investment than standard scouting cameras, but that investment includes numerous benefits. Here they are. Even if care and caution are used, each visit to the woods introduces your presence to deer. The more trips, the greater the impact. As you know, conventional digital scouting cameras require more user involvement and more time afield. To check images, you must visit the immediate camera location and swap SD cards, or worse, review pictures there. In contrast, a cellular-equipped scouting camera instantly e-mails or texts images as they’re captured. 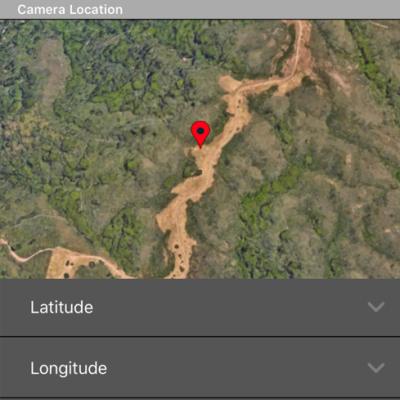 Plus, the only required woods visits are the initial placement, and then to move the camera to a subsequent location or change batteries. Not only does a cell-equipped camera reduce impact, but it also saves time and money. 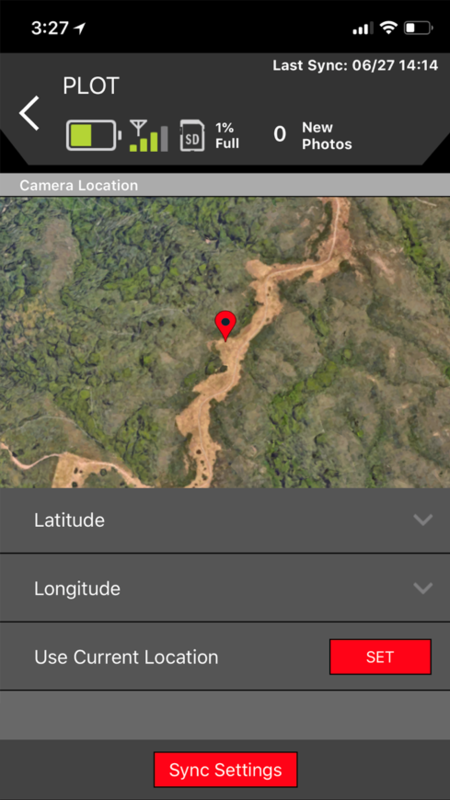 Consider the numerous trips you’d make to your camera location to check images with a standard camera. Throughout a season, it could be dozens. For a cellular camera, it’ll likely be only a few times. You’ll save time and fuel, which is money. In the past, I’ve occasionally captured daylight images of mature bucks within shooting range of my treestands. However, I didn’t know it until days later when the daylight activity had already ceased. In this case, a cellular camera providing instant data could’ve been my ticket to a successful hunt. Wireless cams are excellent for security, too. You can monitor gates, cabins, or other personal property when you’re away which can help identify trespassers and thieves. One example was when an acquaintance’s camera texted him an image of a man robbing the camera. He arrived at the public-land parking area when he identified the thief retreating from the woods. After a confrontation, the owner made the thief return the camera to the exact tree from which he’d stolen it. Lessons were learned, but ultimately, the camera remained under its rightful ownership. If the four advantages of cellular scouting cameras we’ve named align with your goals, it’s time to take the next step and begin shopping. Before you do, let us suggest Stealth Cam’s newest additions to its GXW Wireless Series. 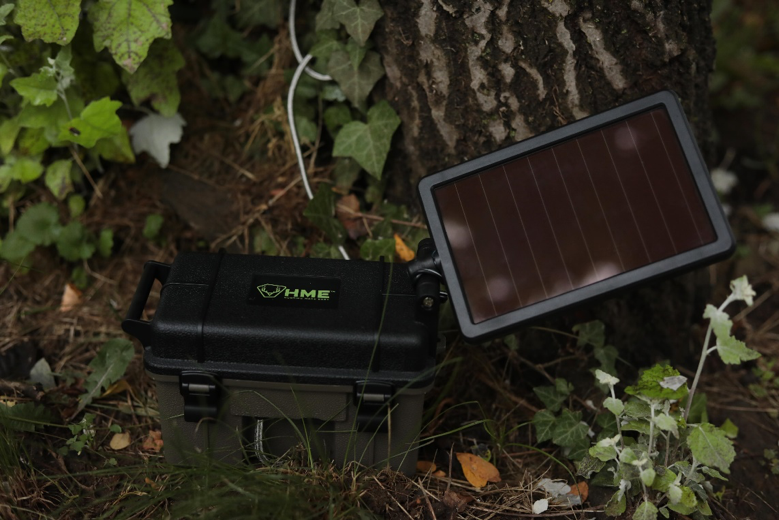 Not only do they offer the sound benefits of wireless technology, but they easily pair with Hunting Made Easy’s HME-12VBBSLR 12V Solar Auxiliary Power Pack ($59.99 MSRP) to reduce battery runs. Two models offer options for optimal wireless service in your area — the GXATW connects with AT&T’s 4G LTE network, and the GXVRW connects with Verizon’s 4G network. 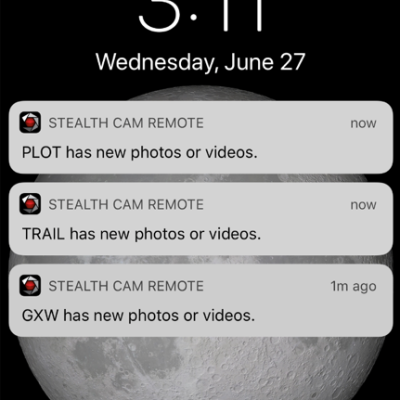 Stealth Cam includes the Stealth Cam app free with both cameras, allowing you to view and manage images, plus adjust camera settings remotely from your iPhone or Android device. 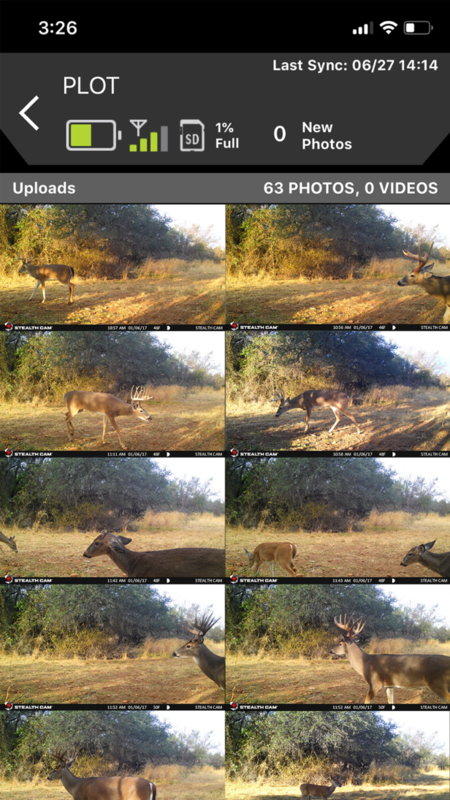 Users can even manage multiple cameras within the app for the ultimate convenience. Currently, the AT&T model is available for purchase and the Verizon version is coming soon. With 22 MP resolution and Matrix Advanced Blur Reduction, you’ll get ultra-clear/crisp images with stunning detail. We want to note that a compressed image/video is sent to your phone, but the high-res version of each image can be obtained directly from the camera’s memory card. This is intentional and helps you manage your data plan, making your money go further. In most cases, the compressed photo/video will help you effortlessly identify the subject. GXW Series cameras shoot 1080p HD video complete with audio recording. A 100-foot flash range is the product of 42 IR emitters. With the Reflex .5-second trigger speed, subjects will be centered for optimal review. GXW Series cameras are also password protected so potential thieves will be unable to use the camera functions. 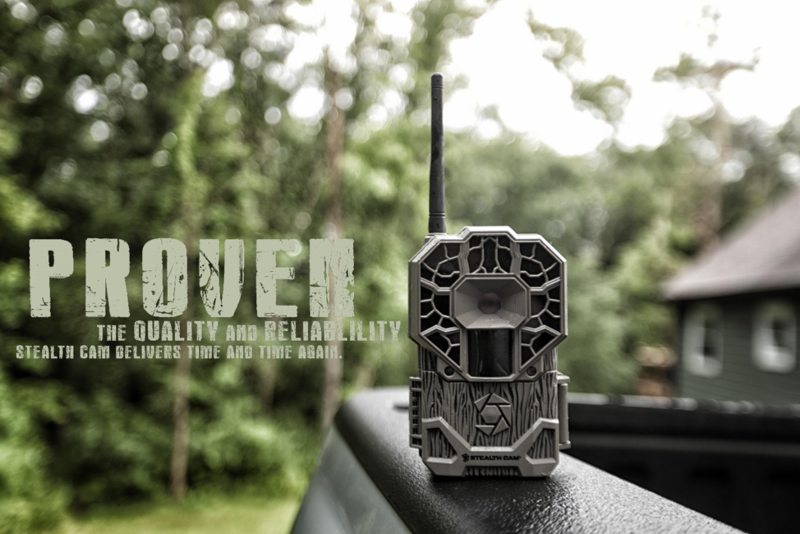 The advantages of wireless scouting cameras could be the missing link in your whitetail strategy. 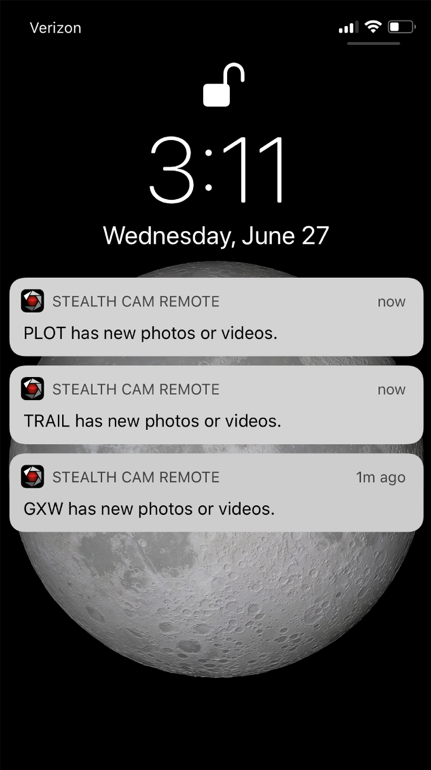 Impressively, Stealth Cam’s GXATW and GXVWR bring wireless technology back into the realm of affordability — both models MSRP at $299.99, but can be found for $249.99 at most retailers. And with September fast approaching, it’s time to visit your local Stealth Cam dealer.